This is a first for me: Two posts in one day! Ay-yay-yay. But hopefully you’ll have as much with both of them as I have! Although I usually have a tough time picking a recipe for the Secret Recipe Club, this month it was no contest. These Asian Lettuce Wraps called to me. Not that Veronica’s Cornucopia doesn’t have a million recipes that I want to try – I’ve bookmarked this Watermelon and Black Bean Salsa, Avocado Chocolate Pudding, and General Tso’s Chicken, to name a few. But I’ve had Asian Lettuce Wraps on the brain for a while and these looked just perfect. I was thrilled to be assigned Veronica’s Cornucopia this month – please stop by and check out her gorgeous blog if you haven’t already! These lettuce wraps provide an excellent, low-carb dinner replete with ginger, garlic, and a number of other Asian-inspired flavors. For an even healthier meal, I substituted Napa cabbage for the usual iceberg lettuce. The flavors come together very nicely, and I highly recommend the addition of the sriracha to give it an added heat. The mouth-feel of the cold, crispy cabbage surrounding each bite of savory meat and vegetables makes for a great experience. Try them as a fun dinner or richly flavored appetizer! These Asian Lettuce Wraps make a great low carb appetizer or entree and come together in just about 30 minutes! Heat the olive oil in a large skillet over medium-high heat. Add the garlic and ginger and cook for about 30 seconds, or until fragrant. Add the turkey, mushrooms, and salt. Cook for 5 to 10 minutes, stirring often and breaking up the turkey with a wooden spoon until cooked through. Add the shredded cabbage and green onions. Cook until the cabbage is just wilted, about 2 minutes. Stir in the soy sauce, sesame oil, sugar, lemon zest and juice, and Sriracha. Remove from the heat and stir in the cilantro. To prepare the dipping sauce, combine all the ingredients and whisk to combine. To serve, carefully remove each individual leaf from the cabbage, place turkey mixture on the leaves and serve with sauce. Yum…one of our favorite dinners, I will try the Napa in there, I do love its crunch! Lettuce wraps are my favorite and I’ve been eating a lot of them lately. These look just perfect! I love lettuce wraps as a healthy, low-carb options. These sound so flavorful! Lettuce wraps are one of my favorite meals, I love your version and am keeping it to give it a try. I LOVE lettuce wraps and yours look delish! Your lettuce wraps look delicious! It’s a healthy way to avoid carb… if I can omit rice (which is often hard to do. 🙂 ). I love these wraps Katherine, I’m going to add some mint and some thai basil to the dipping sauce and I;m going to enjoy them! These lettuce wraps are so healthy and a perfect lunch. Good choice. Sounds delicious! I love lettuce wraps, but have never made them at home. I think I know what will be added to my recipe list this summer! I really like the idea of substituting lettuce as the Wrap wrapper. 😉 (Yeah, that sentence is just on the edge of not working – and maybe over the edge!) Anyway, nice and simple recipe, great flavors – looks might good to me! Thanks for this. 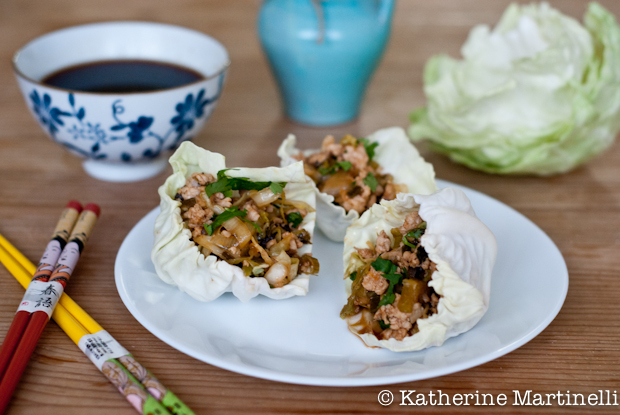 these look fantastic, and i love the idea of using Napa cabbage! I have to admit, I always go to PF Changs just to get these! these lettuce wraps do look good!